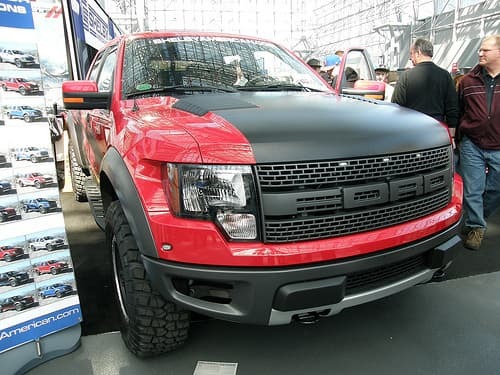 The 2013 Shelby Raptor made its debut appearance at the 2013 New York International Auto Show. Receiving high volumes of attention and acclaim, the Shelby Raptor is car company based out of the state of Nevada. The 2013 Shelby Raptor is Shelby American’s first off road vehicle model. Normally known for producing Mustang style sports model and specialty cars, this manly off terrain vehicle has all the high quality features and quality of previous Shelby American products, combined into one powerful pick up truck. Shelby American has managed to harness the power and pickup of the Mustang into the its latest Shelby Raptor. 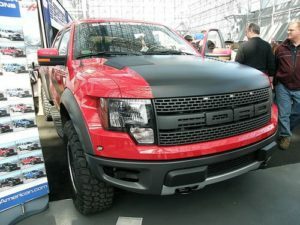 The 2013 Shelby Raptor is a mammoth vehicle with a 6.2 liter Ford V-8 and 575 horsepower. Previous pick up models have horsepower capabilities of only 411 making the 2013 Shelby Raptor a significant upgrade in terms of monster power. The interior is decked out in swanky leather. The 35-inch Goodrich All-Terrain tires that are fitted to the vehicle give the Shelby Raptor the best grip possible on every terrain that is encountered. Other fancy additions include its updated cooling and exhaust system as well as the 6 speed automatic transmission.The 2013 Shelby Raptor definitely comes at a price, however. The price tag of this powerful new model will currently cost those hoping to buy one around $62,625, plus any extra features that you would like added. This includes the basic model of the vehicle plus the standard Shelby elements. Depending on which extra items you decide to tack on to the basic Raptor model, added perks can quickly add up, ending with a total cost of around $70,000. This pick up truck can handle all types of off road landscapes without a problem; from dirt, gravel and hills, to water crossings and passing through muck and wet sand. Test runs on the 2013 Shelby Raptor have brought back positive reviews. A responsive and fast vehicle, the 2013 Shelby Raptor offers drivers a thrilling off road driving experience. Currently, Shelby American will only be producing a limited number of these special trucks; only 100 of these vehicles will be produced next year.